(August 6, 2006) The predominant storyline heading into the 9th Annual Dodge Country 200 by Havoline/NAPA Belts & Hose at Stockton 99 Speedway on Saturday, August 5, centered around longtime friends and local fan favorites Eric Holmes, of Escalon, and Mike David, of Modesto, who came into the race tied for the lead in the NASCAR Grand National Division, AutoZone West Series season standings. It was one event that more than matched all of the hype as David and Holmes staged a classic race long duel that had the crowd of better than 3,400 on the edge of their seats throughout the entire contest. Holmes won more of the battles, earning the pole and leading the most laps during the race, but it was David who won the war by taking the top spot on a lap 144 restart and making it stick for the remainder of the race to notch his second victory of the season and fourth of his career. David and Holmes dominated the stellar 20-car field throughout the entire 200-lap event, which was split into two 100-lap halves with a ten-minute break in between. The two locals ran one-two from the opening laps of the race, trading the lead five times before David made his decisive pass. El Cajon’s Austin Cameron was the only driver able to crash the their private party when he pulled a classic bump and run on David to briefly take second place on lap 135 only to have David return the favor a few laps later. Cameron would ultimately finish the race in fourth behind Peyton Sellers, of Danville, Virginia. David now assumes a razor thin 1,374 to 1,369 point lead over Holmes with just three races remaining on the 12-race Grand National Division, AutoZone West Series schedule for 2006. Given the honor of starting the final West Series race that will ever be held at the 99 Speedway, which is slated to close following the 2006 season, was the legendary Jack McCoy of Modesto, who won a record five Grand National West Series races at Stockton in the late 1960’s and early 1970’s. The HOTWOOD 1000 Series Havoline Western Late Model 100-lap feature was not a pretty one. The first half of the race was marred by seven caution flags, forcing track officials to call the race after just 52 laps due to the strict timetable imposed by the live TV coverage of the Grand National race on HDNet. The premature checkered flag fell with defending track champion Pete Anderson Jr. of Stockton leading Ron Strmiska Jr., also of Stockton, and 2006 season points leader Guy Guibor of Manteca. Modesto’s Harry Belletto, the all-time leader in main event victories at Stockton with 89, had his best run of the season with a strong fourth place finish. Anderson’s victory, his third of the season and 15th of his career, was sweet retribution after his problems last Saturday in which he was involved in an accident with Chowchilla’s Eric Humphries and then banished to the infield for the remainder of the event for what was deemed to be overly aggressive driving by officials. Although the drivers would have preferred the race to have run to its full 100-lap conclusion, most agreed that Anderson had the best car on the night and barring something totally unforeseen, the order would probably not have changed over the remaining laps. “I didn’t have the best car tonight. I was just going to be chasing Pete all evening so I am satisfied with third,” concurred Guibor. To make up for the shortened event, it was announced by promoter Ken Clapp that the Havoline Western Late Model race originally scheduled for 50 laps on Saturday, August 19, will now be run as a special 100-lap race with the same low admission prices. Donny Darter continued his second half of the season surge in the American Limited Stock Car (ALSC) division by taking his fourth win since July 1 and fifth overall for the 2006 season. Stockton’s Pete Anderson Sr. finished the 30-lap main in second, Lodi’s Jeff Ahl nabbed third and ALSC season points leader Chad Holman protected his lead with a solid fourth place run. 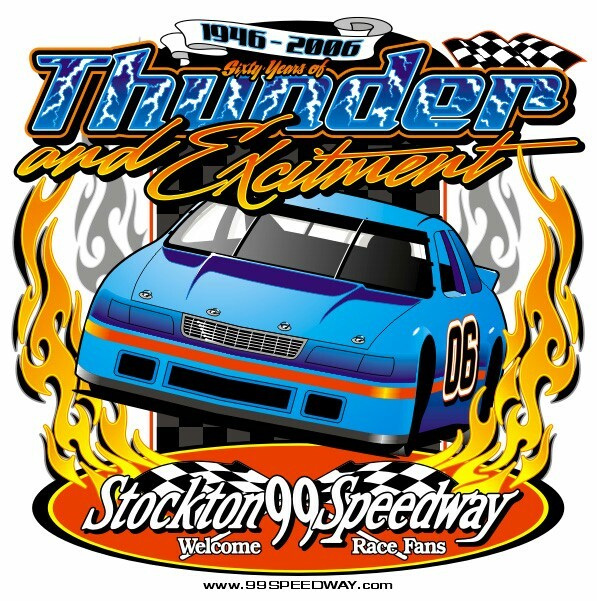 The Stockton 99 Speedway will be back in action next Saturday, August 12, with a big five division Kid’s Night program featuring the NASCAR Dodge Weekly Racing Series Havoline Western Late Models, American Limited Stocks, Pro-4 Trucks, Baby Grands and Young Guns, presented by Havoline/C.L. Bryant. In addition, following all of the great racing action, the front straightaway of the quarter-mile track will be the scene of a smash and bash Giant Destruction Derby.